Look at this new stamp set! It's called Tropical Party and is available in the new Summer Mini Catalog. It's only $18.95 in a clear mount stamp set and has matching designer card stock called Island Oasis. Look at the So Saffron card stock strip on the card. 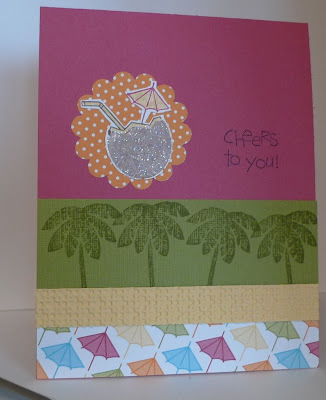 I used the new Stampin'Up Lattice Square Textured Impressions Embossing Folder on the card stock. It feels like paper towel.